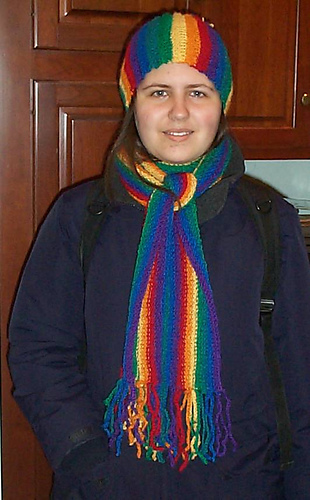 Sideways hat and long scarf set knit in seven colors of sport DK weight yarn. Fringed trim is crocheted. 29” circular needle recommended. Hat is very stretchy, and can fit most folk from 8-year olds through adults. Pattern itself widely available from yarn shop and on-line retailers.